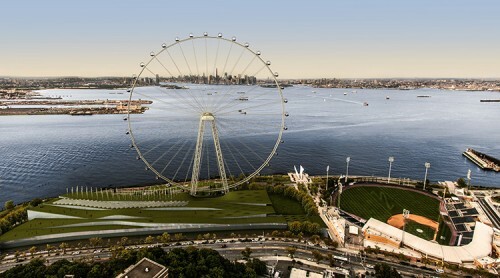 Today, thousands of tourists and New Yorkers make a loop on the Staten Island Ferry between the borough and Manhattan, but as soon as 2016, they will also be able to make a vertical loop on the world’s tallest Ferris wheel, anchoring a new mixed-use project on the North Shore waterfront in St. George. 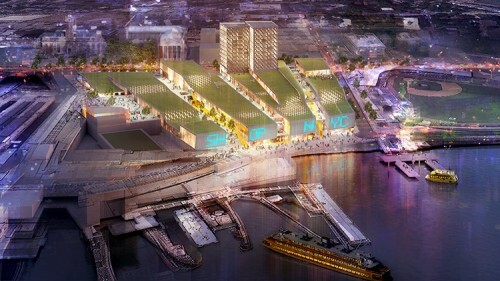 Mayor Bloomberg today unveiled plans for Harbor Commons, which includes 350,000 square feet of retail space for 100 outlet mall stores, a 200-room, 120,000 square foot hotel, and a massive green-roofed parking structure, but all eyes were on the project’s neighbor; the 625-foot-tall New York Wheel will offer stunning views of New York City and its Harbor to an estimated 4.5 million people per year. 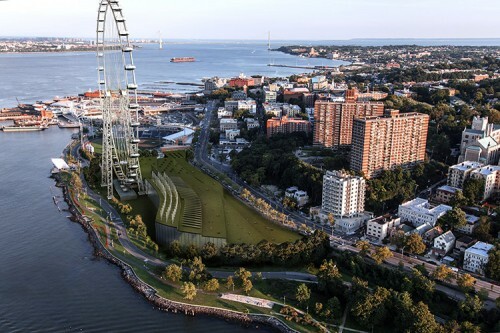 A series of undulating ribbon-like green roof structures are arrayed at Harbor Commons to define three open-air pedestrian corridors through the site. Each ribbon is punctuated by grids skylights where north-south passages connect the corridors. “It’s about organizing pedestrian corridors,” said Chakrabarti. “We looked to create a contemporary version of an Italian hill town. The great hill towns have interesting spines.” Floor plates gradually shift as the site negotiates a 25-foot grade change. Surrounding the New York Wheel, a 100,000 square foot commercial terminal building designed by Perkins Eastman continues the theme of green ribbon roofs, adding an array of wind turbines and solar panels to generate sustainable energy for what’s envisioned as a LEED Platinum facility. 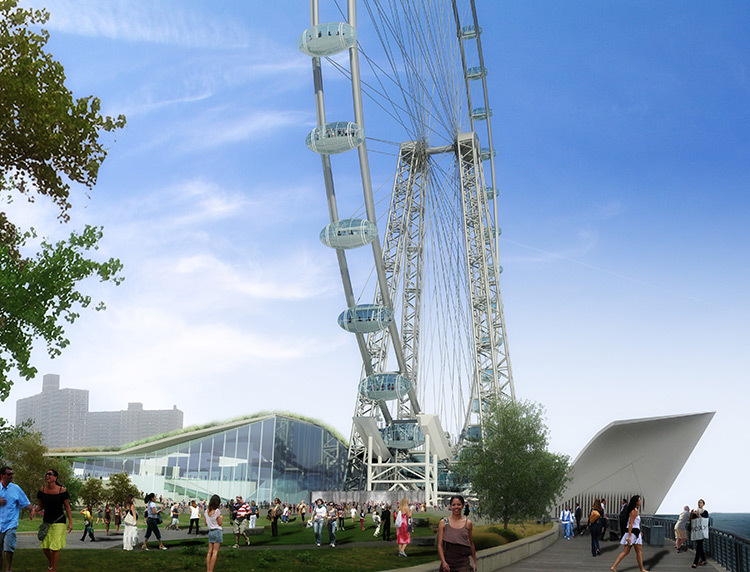 The structure will include restaurant, retail, theater, and exhibition space over a nearly 1,000-car parking structure. 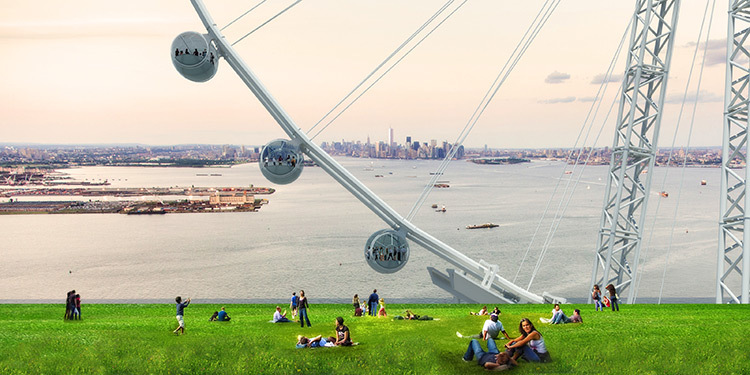 New York Wheel and BFC Partners will sign a 99-year lease for the two development sites, paying the city $2.5 million per year, and plan to begin construction in early 2014 with an anticipated opening in 2016.